Name, age, hometown: Matt "Duder" Dudek, 19, Clarkston, Mich. What corps are you in and what is your role this summer? 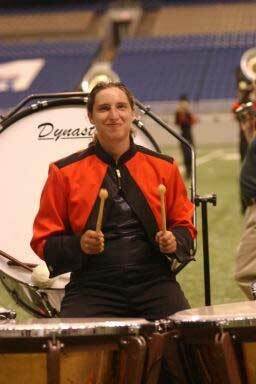 Kiwanis Kavaliers, timpanist Where I go to school and what I'm studying: I'm a music education major at Oakland University in Rochester, Mich.
Give us your full drum corps/marching music background. I marched all four years in high school, along with a year of Division III at Lake Erie Regiment. Now I'm going on my fourth year with Kiwanis Kavaliers. What's your practice schedule like? It depends on the day. Somedays it just consists of me putting on new heads or tuning, other days adding a new part in during the summer. Usually a day in the pit isn't the worst thing in the world. What does your ideal free day consist of? Ha -- free days. My ideal free days involves good food not from the truck, and being able to just relax and pretend music doesn't exist. Favorite pig-out food: Taco Bell. In the shower you can hear me singing: "Float on" by Modest Mouse. It was one of our chill-out songs last year. The last good book I read: "Wicked." I had never read it and someone finally made me. I'm not usually a big reader, but I enjoyed it. The last great film I saw: It wasn't the last, but it was the best. "Baseketball." "No it's not like horse!" Jobs I have/have had: Just school. I worked in a pizza place for a while, but I really didn't have enough time to work. My favorite TV show: "That 70's show." I don't get to watch it that often but I always enjoy it when I do. What has been your formative drum corps moment? 2003, competing in Division I quarterfinals for the first time, and in front of a home crowd for KK. It was a great show and a moment I truly loved. Either that, or dropping a mallet after a timpani solo on the DVD last year. What would you be doing next summer if you were not marching? Working and going to school so I have a chance to graduate someday. How did you decide to be a member of your corps? I was a member of the SPYE PIW indoor line and began to meet members of KK and the staff. I decided that I wanted to someday be a part of that organization. What first attracted you to the drum corps activity? My oldest brother marched in 1992 and 1993 in Northern Aurora. He has always been a great influence on my drum corps life. What advice would you give to young people who want to march? JUST AUDITION! I've met so many students and people who all have the same story about being afraid to audition because they don't think they're good enough. Just go audition! If you get cut from somewhere, look someplace else. There's always corps looking for people and no matter where you march, you'll have a great time and learn a ton. What I want to be when I "grow up": A high school band director. Or maybe a corps director. Favorite drum corps personality and why: I don't really have a favorite. But there are a lot of great people in the activity. Best drum corps show ever and why: Phantom 2003. I just loved watching it and hearing it. The movement and the music was amazing. The year is 2030. What does a DCI show look like? I'm not sure. I really like how a lot of corps are really beginning to push way outside the box, or even the door.